Man is a biological and social being; and in addition to the factor of social self-organization, the biological environment also has had a critical impact on the formation of his spiritual and contemplantive inner world over thousands of years (1). All factors of biocenosis, with which man is related genetically as a system, and the factors of biotope have perhaps maximally contributed to the development of the modern human. In the 14th -15th centuries BC the chieftains (kings) and nobles of the Hurri-Armenian tribe of Mitani (Mittani,Mitanni) living in the south of the Armenian Highland between Lake Van and the Zagros mountains could consolidate a number of the Hurri-Armenian tribes small and middle state formations and establish the State of Mitani which was the first Armenian powerful state in the Armenian Highland. The kings of Mitani struggled successfully against the two powerful states of the ancient world Egypt and the Hittite kingdom and established a powerful state, the boundaries of which stretched from the eastern shores of the Mediterranean Sea and Cilicia to Ashur, Nineveh, Arrapkha (Kerkuk),the Zagros and in the north-east – to the Caucasian foothills. The powerful Mitani had a central position in western Asia. Mitani had taken under its control all the trade routs binding the eastern offshore regions of the Mediterranean Sea with Mesopotamia, Zagros and Pontus. Mitani controlled the region of the sources of the Tigris and the Euphrates rivers as well as rich and blossoming cities of North Syria which were populated mainly by the Hurrians and became rich mainly due to Hurries. Սույն աշխատությունն առաջին անգամ լույս է տեսել 1942թ. 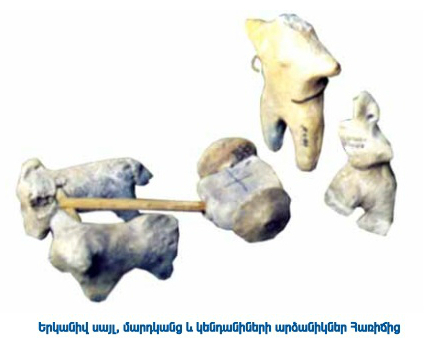 Սոֆիայում, որից էլ կատարված է վերատպությունը: Աշխատության Բ հատորը երբեւէ լույս չի տեսել, եւ նրա ճակատագիրը մեզ անհայտ է:  Խմբ. После труда <Культ бога Ар в Армении> была написана новая книга ‐ <Армения: Колыбель Сотворения и Цивилизации> /на армянском/, где снова затрагиваются вопросы касающиеся культа Бога‐творца АР‐АРА. Она была опубликована в 2002 г. и переопубликована в 2011 г. /241 страниц/. Книга имеет список использованной литературы на армянском, русском и английском языках. Предлагаю прочесть Резюме этой книги. Армения–один из древнейших центров цивилизации. Многовековые следы материальной культуры, мифологические сказания, легенды, географические и личные имена свидетельствуют о том, что армяне–коренные жители Армянского нагорья и проживают здесь с древнейших времен. Греческая историография выдвигала свою версию о происхождении армян. Греческие летописцы (Геродот, Ксенофонт, Страбон) относят армян к фрако‐фригийскому происхождению, исходя из их общих обычаев, форм покроя одежды, видов использованного оружия, также сказания о фесалийском аргонавте Арменосе.